Last weekend was the tenth anniversary of our first march in the SF Pride Parade. We started in '02 in support of SF resident Guy Lowe. Guy was battling AIDS, so his doctor prescribed a service dog to help him with his depression. Rescued from the old Pinole Shelter, she turned out to be the perfect medicine for him. Sadly, despite the fact that Sophie provided an invaluable service and had no behavior problems, his SF landlord evicted him because of her breed type. (News Story) Guy moved and brought Sophie with him. Many pit bull owners are not so resourceful, and SF continues to be one of the hardest places in the bay area to find a rental property that welcomes pit bull type dogs. As a result, pit bull type dogs are routinely surrendered to an early death at the city shelter. 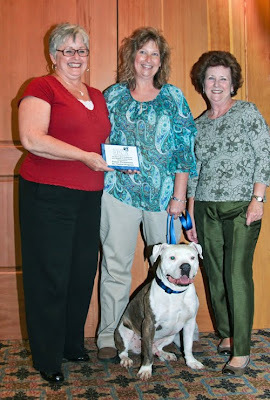 Last month, BR alum 'Big Sal' and his handler Jackie Gunby accepted a Hero Award from Placer SPCA on behalf of the Kaiser Permanente Pet Visitor Program which brings dogs to visit hospital patients. You may remember Sal from this post on his work with psych patients. Left: Program founders Mary Knight, Jackie Gunby, Robbie Sarkisian - and Big Sal himself. Sal showed up as a limping, street weary stray in Oakland, and found a quick spot in our Ambassadog Program. As luck would have it, Sal showed up just as Jackie was starting her search for a four legged partner for therapy work. Kismet! He's a special guy and his adopter is one special lady. She's devoted herself to improving the lives of people through therapy dogs and helps direct the Delta Society so the amazing gifts of therapy dogs can be shared around the country. She and Sal just completed their final task to serve as one of ten teams in Sacramento allowed into UCD Medical Center Hospital. Sal's known for his ability to "work a room" says Jackie, is for "smiling at everyone, snuffing and snuggling with people who ask, happy to be hugged and kissed, and standing very still on his stool so that neuro-rehab clients could touch him." "A family invited us into their father’s room at Kaiser Roseville to visit with him, “he loves dogs!” He was an older man, imposing in stature and has a big voice, someone who “commands a room” with his presence. He’s excited to see a dog and I put Big Sal’s stool on the floor so that the gentleman can reach Sal to pet him easily from his hospital bed. Sal climbs up on the stool, and the man booms, “No, not there! I want him up here on the bed with me!” We put down a sheet, I help Big Sal up on the bed, and he snuggles happily down in the crook of the patient’s arm with his head resting on his shoulder, both of them the picture of contented happiness. He asks me a few questions about Sal, how old is he, where did he come from, but within a minute or two our patient closes his eyes and drifts off. The patient’s wife and adult daughter and I quietly chat, and they tell me that the patient is a life-long dog lover and has 2 dogs at home that he won’t be able to go home and see again. After about 5-6 minutes, the patient wakes up and opens his eyes. I’m watching closely to make sure that he isn’t startled by a strange dog lying in his hospital bed with him, and ready to whisk Big Sal off the bed should that be necessary. Instead, the patient feels the weight of Sal’s head on his shoulder, focuses his eyes on Sal laying there relaxed and comfy, and gently tilts his head down to kiss Sal tenderly on the top of the head, snuggling his cheek against the velvet fur. Our patient closes his eyes again and drifts off again, and this same sequence (awake, realize Big Sal is there, kiss, snuggle, sleep again) is repeated 5-6 times while we visit there for about an hour. Big Sal did his job like a star that day, and someone’s day is better." Thank you Jackie and Big Sal for reminding us once again of the incredible gifts that dogs bring to our human experience. The Elderbulls Blog came out with a fun post last week. It highlights several first-ever dog-related milestones set on the east coast over the last 30 days, and includes Cleveland's big firsts among others. Firsts! 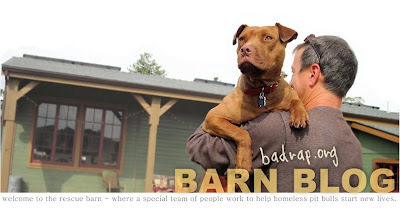 You may have seen this redhead's face on our facebook page, and again on the Barn Dog Blog. Star came to us three weeks ago after surviving a suspected dog fighting operation in Los Angeles County back in March. (News) According to Animal Services Director Marcia Mayeda, Star is the first adult dog the county has ever released to rescue from a dog fighting case. One puppy was spared and went to Karma Rescue. (Thank you, angels!) The first little history makers - all of whom can thank Found Animals for championing their cause. This news comes with heartache, unfortunately. Fourteen of the 17 dogs from this yard were destroyed at the shelters that held them, despite the fact that a large number passed behavior evals with high marks and were slated for rescue. Los Angeles County Animal Services accepted full responsibility for the deaths and blames an internal communication error for the tragedy. Director Mayeda expressed her dismay by phone and told us they're committed to making sure the same mistake isn't repeated. We're surmising that the newness of this type of rescue contributed to the error - It seems 'firsts' rarely come without some degree of confusion and struggle and strife. The Los Angeles case was a big reminder of our need to stay vigilant as the shelter world gets used to a new era with a better way of helping dogs - victims of cruelty especially. So, Star is suddenly even more special in that she managed to escape two terrible fates. We can't get over how well adjusted she is despite her bankrupt past - as is so often the case with dogs from these situations. She's currently enjoying her brand new life at the barn and is helping new volunteers learn the ropes while showing us who she is. It's been a joy. She's a darling and we're honored to be part of so many of her triumphant firsts. Welcome to real life, you little trail blazer. Early this week, Pittsburg Mayor Will Casey presented BR with a lovely declaration, acknowledging our work. It was a huge honor, of course. But in return, we have to acknowledge the City of Pittsburg's decision to embrace non-discriminatory dog owner support work. A humane approach can bring immediate change to communities that struggle with dog-related challenges, and without alienating dog owners or causing them to hide their pets away. More info on this approach: here. 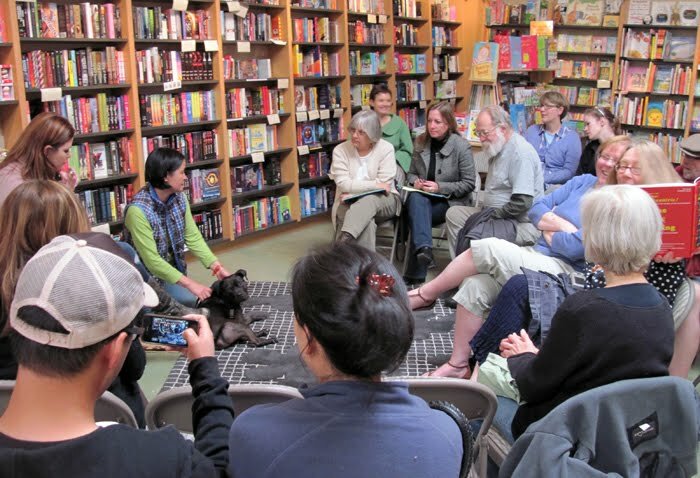 We created this video using some of the wonderful photos captured by Karen Kinney at our Pittsburg event, done in partnership with Well-Pet Vet Clinic and four animal control officers from Contra Costa Animal Services. We hope this approach to dog ownership issues is more than catchy. It sure feels good, and it's getting the job done. LINK for sharing just the video. Push chair away from computer. Turn up volume. Dance like a bliss ninny. We enjoyed a rather historic moment last night, in the comfort of a cozy bookstore in Berkeley. It was a the first public event to discuss 'Saving Audie.' The good folks of Books Inc. set up a couple dozen chairs for the kids that would file in, and elementary school teacher Charity Jara (who wrote the book lessons plans) was prepared to navigate their squirmy, happy voices. Instead - surprise! - the chairs filled with adults. Kids at heart of course, who came out to meet the wriggly little hero dog and hear from his person, Linda Chwistek. It was a standing room only event, and the discussions were fabulous. What a pleasure it was to see this book on display and in the good company of so much information and lessons and tales we tell our children to help them grow up to be wise, compassionate adults. 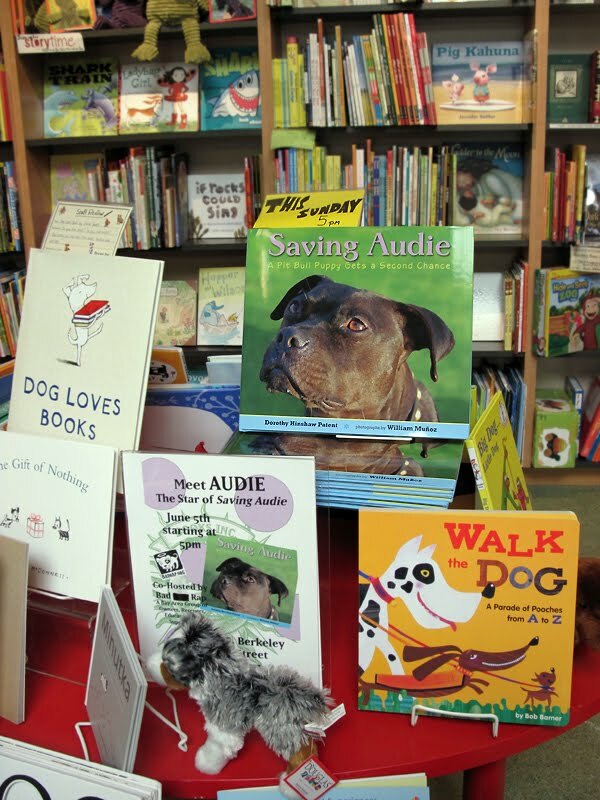 I've been very grateful to author Dorothy Hinshaw Patent and photographer Bill Munoz for their dedication to this story, but never so much as last night, when we saw the book sittin' up all proud in the children's section of a bookstore. The event showed us that the story really is for all ages. We look forward to learning how it influences its readers. My wish? hearing from young adults several years from now who tell us they grew up with this book. Pit bulls, you've arrived. Bless your busy little hearts. So much info, so many ways to post it around. Blogs, website, e-alerts, facebook and more blogs. Eek! We're currently working to re-do BR's website - affectionately known as the mothership - but while we organize ourselves around the many pieces of this work, we're doing a little housecleaning here and have added fancy new tabs (above) to make it easier for readers to access info. Cool, huh? It's a work in progress so please share your feedback. The artist in me is happiest when my favorite things are scattered around in crazy places and colorful piles, so I'm utterly fascinated and envious of minds that know how to create order. With the Rescue Barn project picking up steam, we recognized the need for a separate place to share those stories, photos and lessons. So there's a new blog to bookmark. Don't be afraid, we're organizing it over there too. Not only will you hear from the various team members as we discuss the ebb and flow of canine residents, we've got fancy little tabs to help you keep track of the growing number of foster dog blogs, instructional videos, favorite links and even our wish list. Our original blog will stay put right here and will continue to post updated info on events, issues and general items that affect the status and well-being of pit bulls around the country.